hardworking nature and sense of discipline. The setting and position of the thumb and headline shows that he is self-sufficient and fearless. His open and independent personality is a great asset to anyone on the stage. He is also aggressive, pushy and determined (Mars). All in all a good basic personality profile for a person to possess. 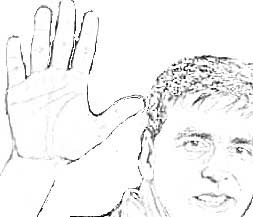 In addition Akki’s hands show talent and imagination (Moon and Apollo), but the talent is more of the practical type (shape of Moon), and of the type that enables him to be a “commercial” actor rather than one who concentrates on honing his talent to perfection. Being realistic, he is not someone who would aim for an Oscar. Akshay’s drawbacks would be that he is not very good at reading people, and could in fact be manipulated by others (low-set Mercury). This does not mean that he is not a little manipulative and cunning himself. What could go against him is that he could show poor judgment at times, in choosing films for example. He is more likely to make decisions based on his heart rather than his head. (Headline, Mercury and thumb). In fact Akshay is rather an emotional man and could let his emotions get the better of him. Considering that his hand also shows an amorous nature (shape of Venus mount), this could translate into someone who easily falls in and out of love. However that is not the case with Akshay. He is the kind who would take love seriously and is not impressionable. He would prefer to be in a long-term relationship. However as his hand shows strong physical passions, his wife needs to be always on guard to ensure that her husband does not stray. Another drawback shown on Akshay’s hand is that he tends to be a little arrogant and this “ego” could come in the way in his relationships with people. While he is not an overly jealous type, he is prone to jealousy (finger shape). If one has to see his hand as a whole it is a good hand except for the significantly low-set Mercury finger. This is probably the reason why he had to struggle so hard to make it in filmdom, and this is also likely to put hurdles in his way in the future. I think it is a credit to his determination and talent that he made it so far, because he certainly lacks the cleverness to be able to manipulate people and circumstances to his advantage. More: Hand readings of other Bollywood and Hollywood actors. I was waiting for you to read his hands, thank you. like shahrukh khan he too entered the filmdom without the shadow of the Godfather..
does his hands tell something about his image as an action/stunt hero, is he really that kind of a person or he tries to portray it...?? Well, I am not sure about his image but yes his image of action hero fits in with his hand. His hand shows robustness, energy and discipline. He would have done well in the sports field as well. Thanks for your comment DI. When it comes to Akshay I know little about him except that he struggled to make it in Bollywood. I am interested in spiritual leaders. Could you do a reading for Parmahansa Yogananda or Maharishi Ramaana. Anonymous, I would love to. However you need to send me photos. I do not have any and nor are there any hand photos on the internet. Thanks. Could you please do a reading for Madhuri Dixit. She's my all time favorite. Only Aishwarya matches her in terms of dedication and screen presence, in my opinion. Madhuri is a favorite with me too. I have got a few photos of her hand but am not satisfied. Now that she has shifted to India perhaps we will see her photographed more often. Hopefully in the next few months sometime I will be able to read her hand, or maybe even earlier. you can check this site out it has a perfect shot of madhuri dixits hands.. Thanks Anuja. It is indeed a good photo. I shall read her hands soon. hi could you please do one on jennifer hudson. she is my favourite singer! Sure, Corrine, I'll check out to see if some decent public photos of her hand are available. If you have any, do send them! deeps, you bet! usually I find it very fascinating. It's like a mystery one gets to solve. did u spot any sun line ..or mercury line cuz of even shades of some development of these lines could transform characteristic of an individual...(u know better) which don't necessarily subject to akshay's case (cuz i think his hand his pretty clear)but i think he has enhanced his manipulative side over the years..it does not come as a surprise though that he has a low set mercury..considering he falls shot of words in any interview of his..aside from him..could u identify any sun line on actor's like aamir or shahrukh..if i am not wrong someone did spot a sun line on some other forum ..which had discussed his hand..i know the picture quality...does not allow easy detection of lines..but if u ever missed this feature..i guess the annalysis would be lot different dont u think..just a thought i had..cuz a individual with such enhanced features(like sun line or mercury).could certainly excercise valuable change in his or her flaws..
atlantis, although Akshay's lines cannot be seen clearly, there is no doubt that he has a sun line. It must be faint and therefore we cannot see it. However I usually do not base my analysis on the lines, but more on the shape of the hand and fingers and the lines are confirmatory. The lines are far less important in evaluating character than the shape of the hand. Most people who study hand reading mistake the lines as being most important. Ofcourse, lines are much easier to read. Finding out whether a finger is long or short (one has to measure it as a low set finger can seem short) or to measure the relative length of the fingers and shape of palm etc is painstaking work. I use a six inch ruler and take detailed measurements. Thank You Nita for doing this! I am sorry that I didn't respond sooner but I was away from home for a bit. Very interesting article! I chuckled a bit about not aiming for an Oscar...so true! Can't wait to read more! Mam, Somewhat my hand is also lil bit similar with akshay kumar. 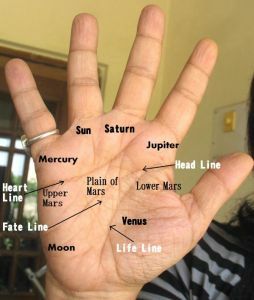 If you see my hand i have one fate line starts from mooon and another parellal line starts from far moon mount edge and reach towards saturn finger. Also there are so many horizontal lines on my mount. Some horizontal influence line starts from venus mount and reach towards fate line or heart line. What does this mean? Even two sunline which crosses eachother on sun mount, what indicates it? Neel, frankly I cannot comment until I actually see your hand. In any case I read the hand as a whole, and not a few lines or signs because one line can contradict another. Reading hands is all about balancing the meanings of contradictory signs. How can i post here my palm print? Neel, it is not possible to attach images in the comment section, not on Blogger at least. If you are interested in a reading, let me know. Thanks.